New College is one of the nation’s best colleges for students seeking a superb education with great career preparation at an affordable price, according to The Princeton Review. The education services company profiles New College in the 2019 edition of its annual guide, The Best Value Colleges: 200 Schools with Exceptional ROI for Your Tuition Investment. The Princeton Review crunched more than 40 data points to tally ROI (return on investment) ratings for more than 650 colleges before selecting the 200 it included in the book. The data are from surveys of administrators and current students The Princeton Review conducted in 2017-18, as well as surveys of school alumni that PayScale.com fielded through April 2018. Survey topics covered everything from academics, cost and financial aid, to graduation rates, student debt, alumni salaries and job satisfaction. In the book’s profile of New College, editors praise the school for its “unique collaborative curriculum [and] emphasis on independent learning.” The profile also quotes current New College students who described the college as a place of “deep and stimulating academics” with a “small, intimate atmosphere” that “has been tailored to us.” New College received an impressive rating score of 91 in the “Academics” section of the profile. The “Career Information” section of the profile lists an exceptional ROI rating score of 90 for New College. It also cites PayScale.com figures reporting New College’s graduates with at least a bachelor’s degree have a median starting salary of $45,800 and median mid-career salary of $91,500. 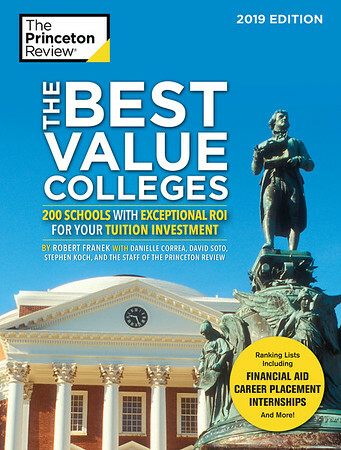 Read the New College profile in The Best Value Colleges: 200 Schools with Exceptional ROI for Your Tuition Investment.